Disclaimer: Disclaimers usually appear at the end of a story. This one doesn't. For good reason. At the outset I need to tell you that the following story has no connection whatsoever to do with the last 5 months of scandal that has rocked Cairns Regional Council. The so-called Cash for Comments, as coined by Thomas Chamberlin at the Cairns Post. Or the Secret Dodgy Radio deal, as coined by Councillor Alan Blake and Sno Bonneau. Or, as the Early Retirement Plan, coined by Noel Briggs. This story has been in the wings since the beginning of this new Council, but has nothing to do with the sudden resignation of former CEO. 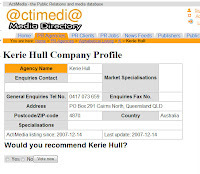 Nor does it have anything to do with the sacking of Council's Communications Manager, Kerie Hull, yesterday. As Councillor Alan Blake was driving Kerie Hull to the airport early yesterday morning, just hours after being accused of "gross mis-conduct", I was putting the finishing touches on this tale. This story, and it's real-life events, are just an amazing coincidence. No mirrors, kickbacks or bribes were accepted in the making of this story. Again, I repeat, it has nothing at all to do with the last 235 days in the life of the inaugural Cairns Regional Council. Amen. Over the last few months, I've had an problem, an aching one. One that I didn't want to deal with, and no matter how long I ignored it, it would have to be dealt with eventually. I knew for some time that it was there, in the background, niggling away. I also knew, at some stage, I'd have to face it head on but, for the most part, I turned the other cheek and got on with the business of the day, hoping it would go away, or simply get better - do what it was put there to do in the first place. Often I didn't even know it was there, but in the background it was festering away, doing some nasty things and undermining almost everything it connected with. It was gradually unleashing havoc, in the dead of night. You see, I had an aching tooth. You can see the actual x-ray here. The one with the red circle is the problem bugger. If you look closely, and for anyone that's had an aching tooth, especially one at the back, will know all too well it's discomfort and it's gradual assault on pleasant living. Some weeks or even months went by, and not a thing. However experts will tell you, it's something that needs to be dealt with, "sooner or later". I guess I was putting off the inevitable, that one day it was going to have to go. It was like a poison, deep inside, that wasn't playing the game, that wasn't getting on with those around it, and didn't do what it was originally put there to achieve. 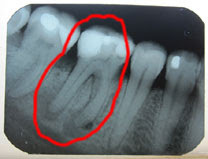 The problem can clearly be seen at the very base of the tooth. The dark round patches are the naughty problem bits. Right in the middle of the inner circle, so to speak, is where the problem lies. It where the infection was causing all the problems. I had to make a decision. Either take to cleaning the insides of it out - a re-bore, or re-programming if you will, or remove the blasted thing so it will stop infecting surrounding neighbours, those that need to and want to get on with legitimate business. To go or not to go, that was the question. Where's a good CEO when you need one, I contemplated. To use an Andrew "Websterism", regardless of who is to blame, the issue has shown the tooth was teetering on the verge of dysfunctionality for some time. So I bit the bullet, and decided to remove the culprit, to once and for all, deal with the ongoing and slowly engrossing pain, and the possibility that any infection could spread and cause more problems in the future. One hour later, I was ready to take on new challenges, fresh and looking forward. The dam problem child was gone. It was like a new dawn. And the cost? About the same as one hour on a John Mackenize talkback show - 250 smackaroons. Last night, with three other accomplices, I roasted the day all this sordid affair came to a final conclusion. As promised, I cracked the Moet, that was in the fridge for the last four months. There were a few close calls, when I nearly popped the top, but it had to wait until the last nasty thing that was causing all the problems, had gone. You wouldn't read about it, but a cheerful CairnsBlog reader snapped this photo and sent it to me yesterday. It's from the side of a vehicle, which he said was spotted parked "very close to the Council Chambers" on Monday. 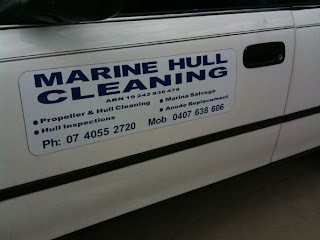 It is a company that appears to offer "Hull Cleaning and Inspections." The sender proposed that the driver must have been holding a meeting with someone rather high up in Cairns Regional Council. 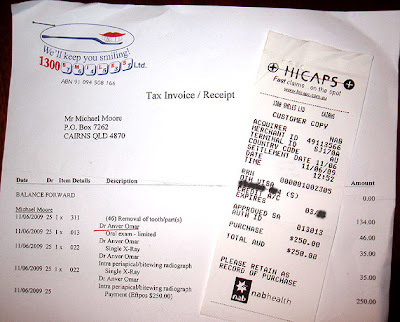 A quick internet search today yielded this wee gem. You can read the small print and answer the question at the bottom.